At Hi Mountian Bison & Buffalo Hunts, we're excited for the chance to have you as one of our guests. We know that hunting a buffalo is an experience that most of you will never forget, and we're proud of the chance to share your adventure with you, and encourage you to see what past hunters have done. 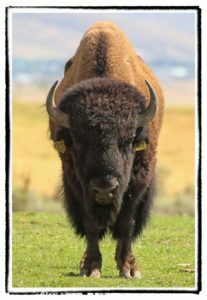 If you're looking to hunt a buffalo, but want to see what kind of prices we offer before you reserve your hunt, you've come to the right place. In addition to the prices listed below, we may be able to negotiate if you are planning a hunt for large groups, so please contact us with any additional questions you have. Hunting reservations can be made by mailing our hunt reservation form or by calling our office. We will guide you into the area at the start of your hunt and help you familiarize yourself with buffalo hunting. After you have shot your bison or buffalo we will assist you with gutting the animal, and then help you load the animal into your vehicle. For those who are interested, we do have a few meat processors we have partnered with who are available upon request. Please remember: all deposits are NON-REFUNDABLE! Due to the nature of the buffalo meat markets, we recommend that you don't delay placing your deposit, if at all possible. Over the last few years, buffalo meat has become much more popular as hunters and consumers recognize the superior taste and health benefits that come from eating buffalo. Although we have grown our herd through sustainable breeding practices, we often purchase new bison to increase the genetic diversity of the herd. What that means for you is that the price you pay for your hunt is somewhat dependent on the overall buffalo market, as we have to compete with other buyers for the best breeding stock for the Hi Mountain herd and to provide you with the best animals to hunt.